One of my close friends is a welder. He always tries to give us a lesson on welding, but we do not happen to listen to him much. Some days ago, my friend and I got into an argument where I was claiming that welding is a straightforward job and it does not require a lot of stuff. He tried to make me understand that welding is not entirely based on just a welder and that it requires additional tools. Even though, after a while agreeing with him but honestly, it did not make any sense to me that welding can be a complicated task to do. Hence, on that very day, after I got back home, I researched things that a rookie welder needs before getting into the job. Here, I am going to tell you everything I have learned about welding tools that a beginner needs to have. A welding helmet is one of the most essential tools you need to have for welding. It keeps your face aloof from any sort of harm while you are welding. The best option in terms of welding helmets is an auto darkening one. It allows you to see through it clearly before starting your welds. Other than that, a standard welding helmet serves the purpose but not the one mentioned before. It is not a mandatory tool for the beginners, but it is better to have it from the very beginning, as it is beneficial to create a square frame. You have to put the two ends of your work-piece into the framing jig, tighten it down and do your welding. If you want to cut off a few inches of a long piece of square tubing, then speed square is straight to the rescue! Set the speed square onto the work-piece, put a mark across the pipe and you will get a 90-degree cut. If you want it to be a 45-degree cut, you can have it too. If you want to know about the thickness of your metal, you certainly need to have a sheet metal gauge. Most of the welders have a chart which has got settings that you need for specific metal thickness. It would be pretty hectic if you had to go through the whole thing to know the width of your metal, and in this case, sheet metal gauge comes in handy. Metal files are great to use while finishing a project. If you have to clean a big piece of metal, then you can use a grinder, but when it comes to giving precisions to the small stuff, you need a metal file. Along with its efficiencies, it is a very cheap tool as well. You will not be able to weld if your work-piece keeps moving away from the working place. With a view to sticking it with the working area, you need to have some clamps. Often, you might have to use as many as 10 clamps at a time in just one project. This one is undoubtedly a very versatile setup. You can use it to bend, cut, weld and many more. Even though it is a very proficient thing, yet you need to be very careful while using it as it can lead you to deadly accidents. Welding gloves are regarded as one of the basic things that you need to have to instigate welding. As a beginner, you should go for thicker welding gloves which will let you hold hot pieces of metal for a few seconds without having any burns. The thin leather gloves are considerably good for TIG welding. Slag coating is created during some welding processes as it acts as a shielding agent. If your welding process creates slag, then you need to have a metal brush. This tool is used to remove slag coating from the worked-piece to reveal the final weld. These equipment are only needed when you work with a MIG welding machine. These are used to remove the contact tip, hot nozzle, and it clips the wire. If you want to keep the nozzle clean, you need to have some plies. Like I mentioned earlier, you will have to chip away at the stag coating if you are using a MIG welding machine. Chipping hammer is mainly used for chipping away the slag. If you use a welding helmet, your face will definitely be protected from getting any kind of harm, but it will not be able to protect your eyes from small pieces of metal while you are doing your weld. To protect your eyes from flying sparks that come off the grinding disk, you can use some safety glasses or a grinding face shield. An angle grinder is also known as disc grinder or side grinder. It is an absolute necessity which is used for grinding and polishing. It is better to have at least 2 angle grinders in which one is for cutting and other is for grinding. You will not have a proper weld let alone a good one unless you consider using C clamps. Even if you got yourself a top-notch welding setting, yet your whole project will get warped if you do not use C clamps. Herein, you need to have around 5 to 10 C clamps to stick all your work-materials together while doing a weld. You will not regret having a welding cart even if it seems unnecessary. Doing a weld might sound like you only need a welding machine to do the job, but now you know that welding requires are a lot of stuff. To store all your welding accessories in a definite place, you need a welding cart. It can be of various sizes. Buy one which satisfies your need. 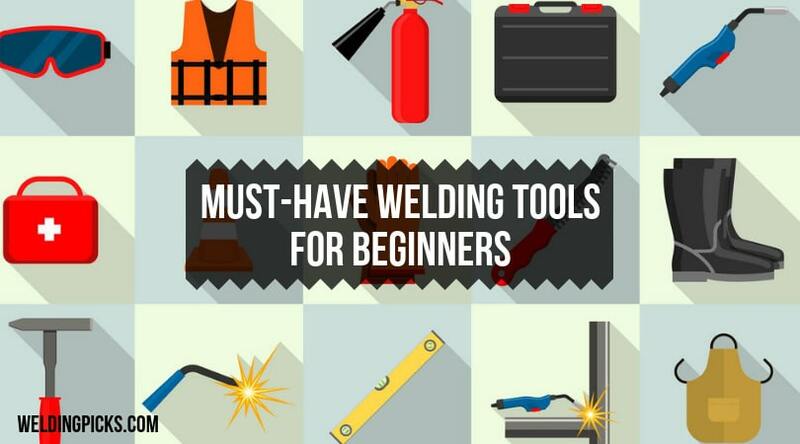 Before you start welding, the tools above are things that you must have. It might appear to you that, there are some things that you need not bother about having yet will undoubtedly provide you with much ease, then I would recommend you to have those as well. If you spend some money now, things that you buy will stay with you for a very long time and once they start making your works easier, you will stop regretting having those at the very first place.